We hope you can find a way to contribute your time, treasures, and talent: Make It Count can use volunteers in all areas of its operation – from fundraising to construction. 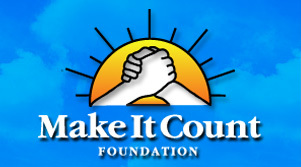 Fundraising: Hold a fundraising party for Make It Count. Learn more about how you can throw an intimate fundraising event for your family and friends. Educate the people you know about Make It Count’s work and raise money for an important cause! Students: Contact us for assistance in creating a fundraising campaign. Make It Count will join your campaign with a Gift Matching program to further impact your efforts! Renovation and Construction: Make It Count specializes in providing much-needed housing renovations to those who need it most. From providing emergency repairs to being part of the construction of new house, Make It Count encourages novices and experts to lend their time to this important cause.